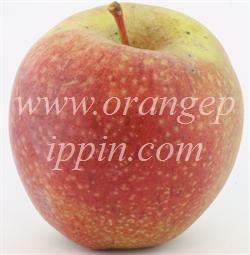 An heirloom American apple variety, commonly found in New York state. Named for the blue-colored bloom. I've crossed this heirloom apple at an orchard store this fall, so I decided to buy a 5 lbs bag. These are huge apples with a very dense flesh. Very filling, not the kind of apple to wake a hunger. I find this apple has a nice pear taste with just enough acidity to taste it properly. Not a juicy apple, but quite moist. The last ones I have feel rubbery when I press them. Good apple but only a "3" note. complex flavor, dense yellowish flesh, aromatic, sweet, a heavy producer. 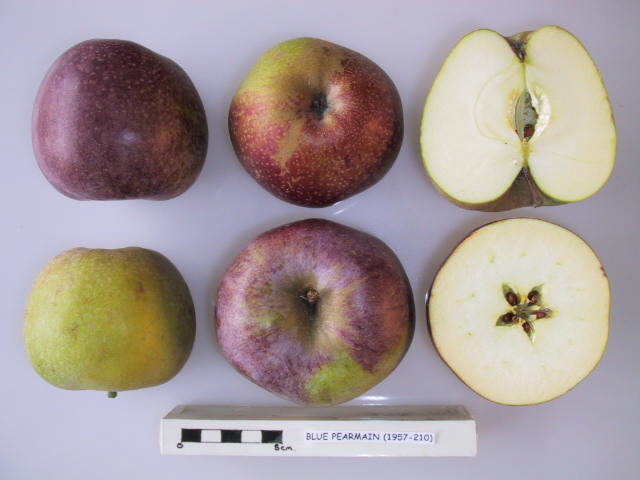 Very large apples with a purplish/blue blush. 40 years ago I moved house. There was one old apple tree in the garden, that had been grafted with 2 different varieties (a 'family tree' I think the Victorians called them). One was not very interesting - a Codlin I think. The other, after many years of trying to identify, I decided was a Blue Pearmain. It was large, with a wonderful taste, and it kept well. Looked like the photos here. Since moving, I've had a lot of trouble finding another - finally planted a young tree 2 years ago. It hasn't fruited yet ... in anticipation! I just found an abandoned Blue Pearmain tree at the beginning of my road in an old field. I have been driving by it now for 29 years and never noticed the red apples on it. I stopped and collected a few. I crunched into one and thought: "This is a really nice apple. I wonder what it is?" It was sweet and crunchy then came a zing of tartness. It had a conical shape similar to a Red Delicious but way beyond the flavor of a red delicious ( a misnomer if there ever was one). There used to be a lot of orchards here in central Massachusetts and I have found other abandoned tress also. I am taking it upon myself to prune this tree. I will also take scions and even try to graft a new tree for my orchard. It is a very striking looking apple. It is a deep red-purple with yellow specks and smells great. The tree must be very disease tolerant as it is healthy and has not one whit of care for the last 29 years and probably longer than that. I am very excited about finding this heirloom tree. "Are those apples really blue?" people would ask when first seeing my Blue Pearmain tree. Of course, the only answer is "yes". Beyond that, Blue Pearmain is a sweet apple with aromatic overtones, little acid, very fine-grained flesh, a little crunch but no snap, and overall, a wonderful apple to eat out of hand. This small tree is healthy on dwarfing rootstock, not demanding, and regularly productive, though not a heavy producer. This should be the ideal backyard tree on a good dwarfing rootstock. This apple has a complex flavor that would be unforgettable if it weren't so amazingly mind-blowing. great for sauce and juice and just to eat. The waxy skin yields an ivory, medium textured, juicy flesh with a sweet and acid balance and a tartness that lingers. The apple makes a fine cider and keeps well in cold storage.